Abbe Trochu’s biography of St Bernadette has been described as “the finest book ever written about Lourdes and its sainted and beloved visionary.” In this age of instant news, entertainment and social media it is important to return to deeper reading of this kind. Abbe Trochu was an internationally noted historian of great religious figures including the Cure of Ars and St Frances de Sales. He drew upon mostly primary sources for his research and presents St Bernadette’s life and the unfolding events at Lourdes in a detailed and inspiring manner. 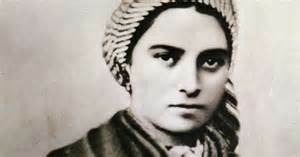 St Bernadette was born on 9th January 1844 in Lourdes, France. Many people know of Lourdes, the miraculous spring, the grotto at Massabielle and that Our Lady appeared to this young peasant girl over a number of days. Our Lady’s message to Bernadette was to pray for sinners and to do penance. Also that a chapel was to be built and that people were to come in procession. Abbe Trochu explains these events and the effect they had on Bernadette herself, her family, the secular authorities and the parish of Lourdes in a way that the reader feels that they are actually there, witnessing the events themselves. Therefore the charming aspect of this biography is that Abbe Trochu includes those aspects of St Bernadette’s life that are most human. The person is not lost under the splendour of the visions. Abbe Trochu emphasises that “Extraordinary signs, intuitions, visions, prophecies, miracles do not constitute it (sanctity) by themselves.” It is interesting to read about St Bernadette’s journey to sanctity which was only just beginning as the visions ceased. Our Lady had said to her “I do not promise to make you happy in this world but in the next.” Is that not a reminder to us as Catholics that we must expect sufferings, trials and setbacks in this earthly life? Rather, they are the way we will merit Heaven and eternal happiness. Bernadette more than understands our difficulties and discouragement! I encourage anyone who wishes to have a deeper understanding of St Bernadette and the Lourdes Apparitions to give this book a try. 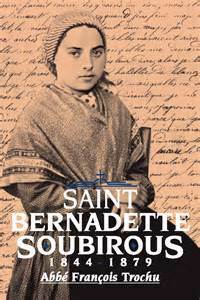 Discover how St Bernadette lived out the Lourdes message with courage, humour and humility. There are many touching accounts and incidents. She was noted for her reverence whenever she made the sign of the cross, her deep devotion to Our Lady, St Joseph and her Guardian Angel. 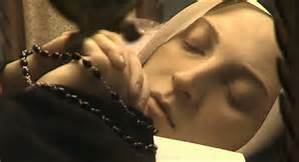 She kept up her daily Rosary all her life. 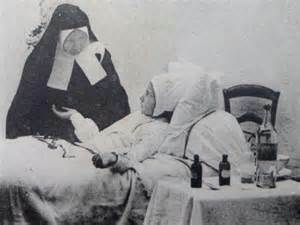 Bernadette was often ill and as a nun spent many long periods in the infirmary. A Superior commented one day “What are you doing there in bed you lazy little thing?” “Why my dear Mother, I’m doing my job.” “And what is your job?” “Being ill.” This is great encouragement for those suffering from illness; that it does have meaning seen in a supernatural light. Here are some sites that have the biography on sale.